FABER-CASTELL sets highest standards in manufacturing its artists' colours. We give top priority to the use of high-quality materials, including light-fast pigments, and the tough leads as a result of our Secural bonding. There are no limits to your imagination when you use POLYCHROMOS artists' colour pencils. The wide spectrum of colours is based on pure pigments, ensuring high covering power and lasting brightness. 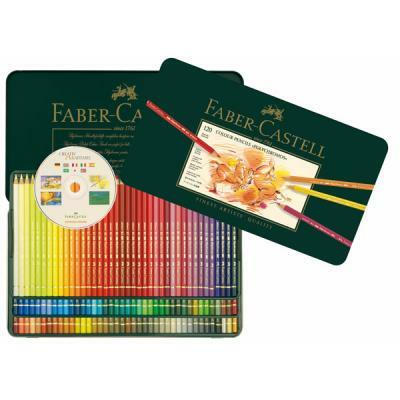 This tin contains the full colour range of 120 pencils, plus a free Creativity Academy CD-ROM. I bought a 36 pack of these pencils and, well, coloured pencils are generally similar in in the way they work on the paper. Some are soft, some are very soft and some are harder. They all have varying different characteristics.